A sport programme must be based principally on the dates of the most important competitions to take part in. These dates (e.g. Olympic games, World or European championships, etc.) are fundamental because they cannot be altered in any way. It is the athlete who must adjust himself to the venues, making efforts to arrive there with the highest possible level of fitness. As a consegunce a sport programme entails the breaking down of the training period into cycles of varying length (microcycles of 5-7 days, mesocycles of 3-4 microcyles), each of which must include specific training activities based on specific work methodologies (overload, pliometrics, general track and field exercises, etc.). 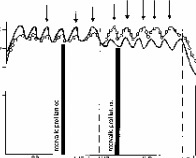 The connection between training sessions, microcycles and structured mesocycles is a task which requires great effort especially in consideration of the cyclic distribution of the TRAINING LOAD which must always be observed. As stated above, the TRAINING LOAD of a single training session results from the summing up of stimuli in the form of all programmed exercises which, as stress agents, have an impact on the human body (internal load) and may be summarized in two parameters called QUANTITY (the total amount of load in a training session) and INTENSITY (relation between load and execution time of programmed load). QUANTITY stands for the number of kilogrammes lifted or the number of kilometres run during training. INTENSITY stands for the objective indication of the amount of work done (e.g.running speed, kilogrammes in maximum load % etc). These two parameters must follow a diversified course since they have different tasks and effects. QUANTITY has formative effects and gives stability to the achievements made, by acting upon mass of energy reserves with a modifying effect on cell modeling potential increasing the capacity of energy meccanisms. INTENSITY has a balancing effect bringing about through massive demand of energy coordination at different levels of functioning. Intensity streamlines specific types of coordination which are necessary for maximum effectiveness and acts upon enzymes which determine maximum potency of the energy meccanism. Certainly the most demanding task for a trainer is determining the QUANTITY (or volume) and the INTENSITY of the content of each training session, by illustrating the connection between all the proposed sessions in a graph for a long period of time (even for a year). This allows for a careful distribution in cycles which must be structured according to the objectives to be reached on the basis of the calendar of competitions. Various authors (Vorobjev fig.A, Tschiene fig. B, Matwejev fig. C) have proposed a host of models for a year programme in which different periods of training (preparation, pre-competition, competition) are shown. INTENSITY falls sharply reaching minimum level. - the date of the most important competitions. Being able to turn QUANTITY and INTENSITY into numbers allows checking that the training plan matches the objectives set in advance when the yearly training programme was made. This implies that it is possible to compare for a given time the methodologies of training used in a given session with the level of QUANTITY and INTENSITY set for that given date. Nevertheless checking can be carried out only when the programme covers a long period of time (preferably a whole sports year). This quantity comes from a calculation based on training load, number of repetitions, execution time, recovery time, etc. for each programmed exercise and training session. The percentage results are placed on a Cartesian plane so that the two functions of QUANTITY and INTENSITY are illustrated. The graph built in this way enables the checking of yearly periodization. Certainly this is the major problem of sports programmes, particularly for those sports with a cyclic nature (track and field events, swimming, boat-racing etc.) where degree of fitness depends on technical preparation and which are the most demanding because checking implies an enormous amount of calculations. Therefore finding all the values of QUANTITY and INTENSITY and placing them onto a graph for easy consultation is a process requiring the use of a personal computer which enables us to gain results in a matter of seconds through rapid calculations. The example contained in figure D shows how QUANTITY and INTENSITY may be set when the whole sporting year is divided into a winter and a summer phase, the latter characterized by a particularly important competition. In this context the two phases have been structured so that the former has "quantitative" objectives, whereas the latter has "qualitative" ones. (Each column stands for a training session). This function is vital in muscle re-education especially when a training plan for highly qualified athletes is made, who are given "approximate" re-entry dates, which however are not strictly binding. Taking the latter as a reference point, it is possible to shape the whole re-education programme by using the same criteria applied for example to the preparation period, the pre-competition period, checking QUANTITY and INTENSITY constantly to avoid an imbalance in the programmed increase of muscular-tendinous-articular work. 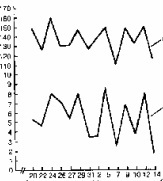 The afore mentioned shows that a graph study of quantity/intensity distribution in yearly periodization enables each trainer to deal with the organization of the training process by himself because through the use of current powerful systems of processing, it is possible to obtain extremely complex results in a very short time (a few seconds). In this way the trainer becomes a mathematical and scientific system. Consequently empiricism, which has dominated the world of sport until today, is being erased as much as possible.